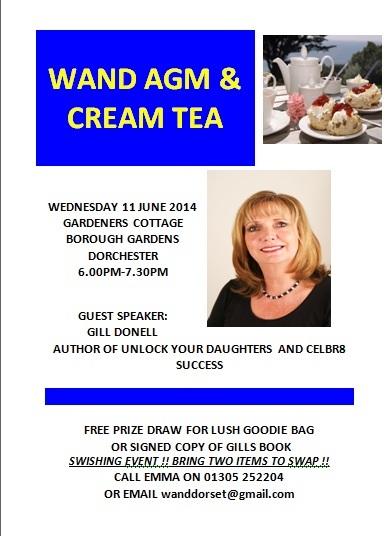 You are invited to join the launch of WAND’s ‘Year of Empowerment’ at our AGM, on Wednesday 11June, 18.00 -19.30 at the Borough Gardens Cottage, West walks, Dorchester. Our guest speaker, Gill Donnell MBE said “I am really thrilled to be asked to speak at the WAND AGM and look forward to supporting the launch of their ‘Wake up Women – A Year of Empowerment’ campaign”. Gill’s website ‘Unlock Your Daughters’ details her expertise in motivating women, and is sure to get the year off to a good start. Gill has kindly donated a signed copy of her latest book, ‘Celebr8 Success’ as one of the prizes, in the free prize draw for all women attending. If you come along to the AGM you can bring along two items of clothing, jewellery of accessories, and take part in a free ‘swish‘ where you can swap the items with other women . 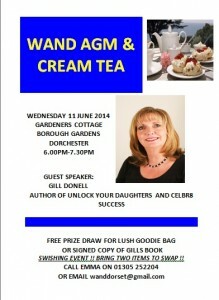 The WAND committee will also be serving up a delicious cream tea! For information on the event, or for more information about the organisation email wanddorset@gmail.com, or telephone Emma on 01305 252204. This entry was posted in Event, Uncategorized on May 19, 2014 by mariac.